Although healthcare quality and patient safety have longstanding international attention, the target of reducing diagnostic errors has only recently gained prominence, even though numerous patients, families and professional caregivers have suffered from diagnostic mishaps for a long time. Similarly, patients have always been involved in their own care to some extent, but only recently have patients sought more opportunities for engagement and participation in healthcare improvements. This paper brings these two promising trends together, analysing strategies for patient involvement in reducing diagnostic errors in an individual's own care, in improving the healthcare delivery system's diagnostic safety, and in contributing to research and policy development on diagnosis-related issues. Patient involvement in improving diagnostic safety is conceivable at multiple levels: one's own diagnostic processes and outcomes; the diagnostic delivery system; and research and policy related to diagnostic safety.23 This paper aims to synthesise background regarding patient involvement in the diagnostic process for each of these three levels, and suggests priorities for future efforts. To inform our synthesis, we reviewed international initiatives related to patient involvement in patient safety broadly, and conducted targeted literature searches in PubMed and PyschInfo using the basic logic: (‘patient involvement’ or ‘patient engagement’) and (‘patient safety’ or ‘diagnostic error’ or ‘diagnostic delay’) with variations to make the strategy more inclusive (eg, ‘involvement of patients’, ‘consumer’, ‘client’). We also drew substantially from five patient-centred sessions at the 2012 Diagnostic Errors in Medicine Conference that were designed to crystallise the experiences of patient and family representatives into lessons about potential patient involvement to reduce diagnostic errors.24 Finally, drawing on this synthesis and considering the unique aspects of diagnosis relative to treatment, we propose a framework for research design to evaluate personal and sociological factors associated with more or less involvement by patients during the diagnostic stage of care. Diagnosis is the trouble-shooting stage of care that arises in response to symptoms of a problem or routine screening, while treatment involves formulating and implementing the care plan, after problem identification. Although distinction between the diagnostic stage and treatment stage blurs in cases of empirical treatment, the medical profession (and society more broadly) uses the two categories—diagnosis and treatment—because they differ conceptually and practically. Role of reasoning: those interested in diagnostic error have concentrated on understanding the reasoning process of the diagnostician (eg, Systems 1 and Systems 2 typology of intuitive vs deliberate thinking), and the potential failure points due to cognitive heuristics and biases.26 ,27 To the extent that patients are involved in diagnosis, they also could be prone to the same biases. Avoidance of uncertainty: people often feel distress under conditions of uncertainty, with anxiety decreasing after diagnosis.28 Knowledge asymmetries between patient and doctor foster collusion that the diagnosis is right once made, instead of just a working diagnosis. Inadequate feedback dynamic: significant delays in seeing problems with diagnosis create challenges for a system of feedback and learning about breakdowns, especially for patients encountering numerous doctors and disconnected care sites during the diagnostic process. Physician centrality and resultant deference by others: nurses, technicians and others who ‘touch’ the patient may see signs of deterioration or patterns that are diagnostic, but they have been socialised and legally required to operate within ‘scope of practice’ which typically excludes diagnosis. Therefore, they may not easily speak up about problems with diagnosis. Patients may follow suit. Patient inexperience with the diagnostic process: while patients have expertise in their own experience of symptoms, they typically have minimal knowledge about their diagnostic journey to an unknown destination. The patient does not necessarily know what information is valuable for diagnosis, or when to be concerned that diagnosis is off track. While each patient and situation has unique aspects, patients often find barriers to productive involvement in their diagnostic journey, in cases when involvement is feasible. A persistent challenge facing many patients is suboptimal communication with their physicians and, related to this, the ‘(im)balance of power’ between physicians and patients. Despite consensus about the importance of patient autonomy—and, in turn, the resulting efforts to enhance physician–patient communication, shared decision making, and patient-centred care—evidence suggests specific hurdles. In one recent qualitative study, focus groups of primary care patients described hierarchical relationships with physicians, characterised by less-than-candid conversations and information exchanges.29 Patients described physicians as ‘authoritarian’. Moreover, even though participants in this study had above average levels of education, and had often sought information from outside sources, either to verify or to make sense of the discussion with their doctor, they were still reluctant to ask questions during their visits for fear of ‘second guessing’ or being perceived as difficult or contrary by their physicians. In other instances, patients and their families may face too many choices without enough physician guidance or coordination. Related to communication and coordination is the barrier of health literacy. While patient understanding can be improved with clearer communication by providers (using plain language and avoiding medical jargon), communication alone does not provide for a full understanding of medical complexities.29 Assimilation of medical information (eg, possible conditions; rationale for diagnostic tests; insurance considerations) is a daunting task for patients, yet it is essential for becoming an informed consumer. Several Diagnostic Errors in Medicine conference sessions resulted in a list of common challenges experienced by patients and families during delayed, missed and erroneous diagnoses, whether in the hospital or over the course of numerous outpatient visits (box 1). What can patients do today to improve diagnosis? Will the tests you are proposing change the treatment plan? Are there findings/symptoms that do not fit your diagnosis? Can you facilitate a second opinion by providing me with my medical records? When should I expect to see my test results? What resources can you recommend for me to learn more about diagnosis? Other approaches for involving patients in healthcare decisions regarding treatment might also be applicable when patients first meet with their providers, seeking diagnosis. For example, educational training efforts to improve physician–patient communication often focus on the physician, but can materials be developed to help train patients to initiate questions and communicate more effectively? Can educators and advocacy groups develop simulation exercises—that is, immersive experiences that help familiarise patients and their families with the healthcare system? How can health coaches or patient facilitators help patients become engaged effectively in the diagnostic process? Why should patients want to become part of the process? To be sure, patient engagement in health-related decisions requires time and effort on the part of patients and family members.40 We have described it here as a potential path to reduce diagnostic errors, but patient involvement and enhanced physician–patient communication can potentially yield other benefits as well. For example, in a 2007 survey of more than 15 000 households, Hibbard and Cunningham found that ‘activated patients’ who were engaged in their health reported having fewer delays in seeking medical care.41 Two-way communication provides physicians with feedback and improves clinical reasoning,42 regardless of whether the patient provides confirmatory information (in support of the physician's hypothesis) or contradictory information (that may require reconsidering the current hypothesis). Healthcare organisations use many different tools to discover patient safety problems, but the instruments currently in use are generally ineffective in capturing diagnostic errors.43 Patients can therefore play a critical role in bringing these to light by reporting diagnostic errors, stimulating the organisation to study these incidents and consider improvements.6 ,44 The Agency for Healthcare Research and Quality is developing a new national reporting portal for all patients and caregivers. A Canadian study post paediatric hospital admission found that patients and their families are willing and able to report valid safety concerns, and that very few of these (less than 3% in this study) had been identified by the hospitals’ own safety-monitoring programme.45 Similar findings have been reported from Japan,46 Sweden47 and the USA.48 ,49 Patients are also able to report diagnostic errors in ambulatory settings; a recent survey of primary care patients found that 13% had experienced a diagnostic error.20 Studies of the factors that facilitate and hinder feedback are needed to improve reporting in the future,50 with special attention to diagnostic problems. Hospitals and ambulatory practices are increasingly using patient advisory groups to provide feedback and advice on current performance.52 Similarly, input from patients through surveys is now expected and required in most healthcare settings. A new opportunity for a patient to improve the safety of healthcare and avoid diagnostic errors is to help another patient. The wisdom of someone who has already experienced a medical error makes ‘patient advocate’ programmes invaluable to patients who have taken advantage of such services.53 These three pathways reflect the growing trend for healthcare providers to utilise the patient's perspective and involvement to improve quality, safety, timeliness and value of their own healthcare delivery systems. Multiple national leverage points exist in diagnosis. Several contemporary initiatives illustrate the opportunity and challenge. The ‘patient centred medical home’ (PCMH) is becoming a reality in many locations.59 What makes PCMH a policy imperative is the anticipation that emergency room utilisation will fall and hospital readmissions will decrease. However, patients often do not know how to optimally use their ‘medical home’, and do not take advantage of newer services like expanded office hours and telephone visits. As researchers evaluate PCMH, and policymakers set up incentives for this care approach, they are likely to benefit from input from patients about ways to maximise the likelihood for PCMH to be part of the solution to diagnostic errors. Finally, the recently launched Patient-Centered Outcomes Research Institute offers an opportunity for patients to become personally involved in research directed specifically at problems of most interest to patients and their families. For example, what do we need to understand about the health system and doctors responses to different types of involvement and communication during diagnosis (eg, Boxes 2 and 3, and others from ‘The Take Charge Patient’ based on 200 interviews with patients, families and healthcare professionals)?17 How do we measure diagnostic error in a patient-centred way? What are the effects of malpractice policy on patient involvement in improving diagnosis? Studying patient involvement and diagnostic error requires research in four priority areas. First, we need a theory to guide diagnostic error prevention, with a primary focus on patient involvement in care, recognising informal caregiver involvement as well. The scope of such theory-based research includes defining terminology and hypothesised relationships such as those shown in figure 1. 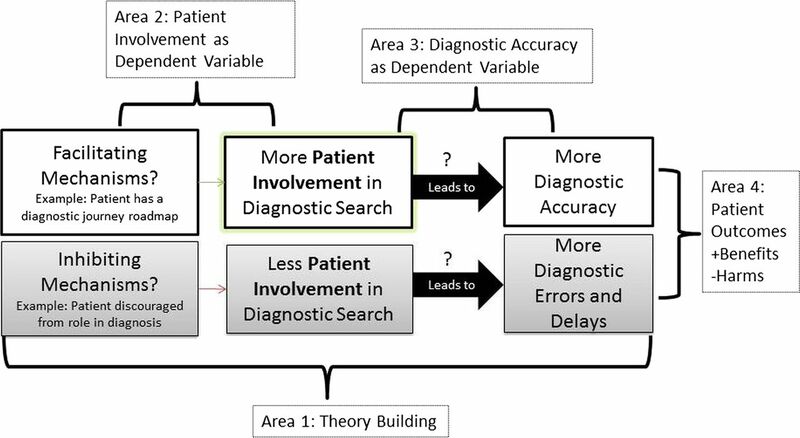 Patient involvement is in the middle of a causal sequence with some factors influencing patient involvement level, and then, in turn, patient involvement becoming the independent variable in predicting variation in diagnostic safety. Refining this initial theory would require qualitative, experimental and quantitative observational research and further theory building. Mounting evidence supports that social relationships and associations have a strong effect on health, and available conceptual models of important linkages from macro-social to psychological and biologic processes could be overlaid with the patient's journey through the diagnostic process.63–65 Second, we need research exploring factors encouraging and inhibiting patient involvement in diagnosis. What increases involvement and what decreases it? What exactly counts as involvement in the diagnostic search? Third, we envision projects testing whether more patient involvement leads to better diagnostic performance, and under what circumstances. Fourth, and critically, we need research that evaluates the effects of involvement on the endpoints of patient and economic outcomes, including unintended adverse effects (eg, unnecessary testing). While the diagram is highly stylised and simplified, its depiction of relationships among major research areas could enable iterative learning and application of previous findings on patient involvement in safety and quality improvement broadly. Further consideration of ways that diagnosis resembles or differs from other areas of medical practice is important in developing a strategy to study patient involvement in improving diagnostic safety. Simplified schematic of priority research areas. Diagnostic errors mete out a high cost to patients and their families, and to professional caregivers.66 We have proposed engaging healthcare consumers at three levels to improve diagnostic processes and decisions: a role in a patient's own care to the extent feasible, a contribution of advising and providing feedback to the delivery system, and more globally, a crucial voice for informing policy and research agendas. Patients are now being encouraged to take a more proactive role in their own care and safety, and programmes such as the PCMH and personal health records give them the opportunity to do so. To the extent that patients want this involvement, the opportunity exists for developing patient-oriented strategies to reduce diagnostic errors, and improve the safety and quality of healthcare in general. Many efforts are underway to support consumer involvement in the healthcare arena (eg, the Society for Participatory Medicine, movements like ‘Let Patients Help’67) and others are directing their supportive suggestions to the diagnostic slice of medicine (eg, books written and organisations formed by those who have experienced diagnostic errors).16–19 ,67 Bringing attention to diagnostic safety and understanding its particular challenges to patient participation is new territory for some, but well trod by many others who have experienced problems and hope that the lessons they have learned will help other patients, the delivery system and policymakers.16 ,67 ,68 It is time for the research field to direct its attention to the intersection of diagnostic safety and patient involvement. Patient Experience Network (NHS). 2006–2013; http://www.institute.nhs.uk/share_and_network/pen/publications.html (accessed 24 Jan 2013).
. Patient involvement in patient safety: what factors influence patient participation and engagement? Health Expect 2007;10:259–67.
. Decision aids for people facing health treatment or screening decisions. Cochrane Database Syst Rev 2001;(3) Diagnostic Error in Medicine:CD001431.
. Can patients report patient safety incidents in a hospital setting? A systematic review. BMJ Qual Saf 2012;21:685–99.
. eds. Patients charting the course: citizen engagement and the learning health system: workshop summary. Washington, DC: The National Academies Press, 2011.
. Shared decision making—pinnacle of patient-centered care. N Engl J Med 2012;366:780–1.
. Patient safety strategies targeted at diagnostic errors: a systematic review. Ann Intern Med 2013;158.
. System-related interventions to reduce diagnostic errors: a narrative review. BMJ Qual Saf 2012;21:160–70.
. Diagnosing diagnosis errors: lessons from a multi-institutional collaborative project. In: Henriksen K, Battles JB, Marks ES, Lewin DI. eds. Advances in patient safety: from research to implementation (Volume 2: Concepts and methodology). Rockville, MD: Agency for Healthcare Research and Quality, 2005.
. Pediatric emergency medicine: legal briefs. Pediatr Emerg Care 2011;27:1213–15. Americans are concerned about hospital-based medical and surgical errors. Wall Street Journal Online's Health Industry Edition. 20 July 2004.
. My voice: a physician's personal experience with throat cancer. Charleston, SC: BookSurge Publishing, 2009.
. The take-charge patient: how you can get the best medical care. Santa Monica, CA: Lemon Grove Press, 2012.
. Top screwups doctors make and how to avoid them. New York: Harmony, 2011.
. Josie's story: a mother's inspiring crusade to make medical care safe. New York: Atlantic Monthly Press, 2009.
. Patient perceptions of mistakes in ambulatory care. Arch Intern Med 2010;170:1480–7.
. Patient and family engagement: a framework for understanding the elements and developing interventions and policies. Health Aff (Millwood) 2013;32:223–31. Diagnostic Errors in Medicine, Program Booklet, 5th International Conference, 11–14 November 2012. http://www.hopkinscme.edu/pdfs/80028747.pdf (accessed 27 Jan 2013).
. What the evidence shows about patient activation: better health outcomes and care experiences; fewer data on costs. Health Aff (Millwood) 2013;32:207–14.
. Improving diagnostic reasoning to improve patient safety. Permanente J 2011;15:68–73.
. Distress in the radiology waiting room. Radiology 2011;260:166–73.
. Authoritarian physicians and patients’ fear of being labeled ‘difficult’ among key obstacles to shared decision making. Health Aff (Millwood) 2012;31:1030–8.
. Examining critical health policy issues within and beyond the clinical encounter: patient-provider relationships and help-seeking behaviors. J Health Soc Behav 2010;51(Suppl) Diagnostic Error in Medicine:S80–93.
. Introduction—a sociological focus on ‘expert patients’. Health Sociol Rev 2009;18:139–44.
. Formal design methods for reliable computer-aided diagnosis: a review. IEEE Rev Biomed Eng 2012;5:15–28.
. Every patient tells a story: medical mysteries and the art of diagnosis. New York, NY: Broadway Books, 2009.
. FindZebra: a search engine for rare diseases. Int J Med Inform 2013;82:528–38. The Joint Commission: Facts about Speak Up Initiatives. http://www.jointcommission.org/assets/1/18/Facts_Speak_Up.pdf (accessed 13 May 2013).
. Family centered patient advocacy training. Chapter 9: steering clear of diagnostic errors. State Wantagh, NY: PULSE of NY, 2007. I Wish I Had Asked That! A worksheet for patients. Informed medical decisions foundation web site. http://informedmedicaldecisions.org/2012/12/11/i-wish-i-had-asked-that-a-worksheet-for-patients (accessed 28 Jan 2013).
. From the ‘expert patient’ to ‘expert family’: a feasibility study on family learning for people with long-term conditions in Italy. Health Sociol Rev 2009;18:182–93.
. How engaged are consumers in their health and health care, and why does it matter? HSC Research Brief 2008;(8) Diagnostic Error in Medicine:1–9.
. Minimizing diagnostic error: the importance of follow-up and feedback. Am J Med 2008;121(5 Suppl) Diagnostic Error in Medicine:S38–42.
. Integrating incident data from five reporting systems to assess patient safety: making sense of the elephant. Jt Comm J Qual Patient Saf 2010;36:402–10.
. Patient-assisted incident reporting: including the patient in patient safety. J Patient Saf 2011;7:106–8.
. New system for patients to report medical mistakes. The New York Times 22 September 2012.
. Patients’ identification and reporting of unsafe events at six hospitals in Japan. Jt Comm J Qual Patient Safety 2011;37:502–8.
. Reporting of sentinel events in Swedish hospitals: a comparison of severe adverse events reported by patients and providers. Jt Comm J Qual Patient Safety 2011;37:495–501.
. Adverse events during hospitalization: results of a patient survey. Jt Comm J Qual Patient Safety 2008;34:583–90.
. Overconfidence as a cause of diagnostic error in medicine. Am J Med 2008;121(5 Suppl) Diagnostic Error in Medicine:S2–23.
. Engaging patients to improve the healthcare experience. Healthc Financ Manage 2012;66:84–8.
. Family centered patient advocacy—a training manual. New York: PULSE of NY, 2009. http://www.pulseofny.org/Tools.html (accessed 24 January 2013).
. Diagnostic error in internal medicine. Arch Intern Med 2005;165: 1493–9. Society to Improve Diagnosis in Medicine. http://www.improvediagnosis.org/ (accessed 13 May 2013).
. Consumer involvement in health research: a review and research agenda. Health Policy 2002;61:213–36.
. A CTSA agenda to advance methods for comparative effectiveness research. Clin Transl Sci 2011;4:188–98.
. The Patient-Centered Outcomes Research Institute (PCORI) national priorities for research and initial research agenda. JAMA 2012;307:1583–4.
. The patient-centered medical home: a systematic review. Ann Intern Med 2012.
. Personal health records: a scoping review. J Am Med Inform Assoc 2011;18:515–22.
. Consumer attitudes toward personal health records in a beacon community. Am J Manag Care 2011;17:e104–120.
. Patient perceptions of a personal health record: a test of the diffusion of innovation model. J Med Internet Res 2012;14:e150.
. From social integration to health: Durkheim in the new millennium. Soc Sci Med 2000;51:843–57.
. Sociologic influences on decision-making by clinicians. Ann Intern Med 1979;90:957–64.
. Patient participation: current knowledge and applicability to patient safety. Mayo Clinic Proc 2010;85:53–62.
. Medical error: the second victim. The doctor who makes the mistake needs help too. BMJ 2000;320: 726–7. Rory Staunton Foundation. http://www.rorystaunton.com/index.php (accessed 27 Jan 2013). Contributors KMM, CLB and MLG each made substantial contributions to the conception and design of the article, drafting the article, and final approval of the version to be published.